Business Process Outsourcing (BPO) is a form of outsourcing that involves the contracting of the operations and responsibilities of a specific business functions (or processes) to a third-party service provider. Originally, this was associated with manufacturing firms, such as Coca Cola that outsourced large segments of its supply chain. In the contemporary context, it is primarily used to refer to the outsourcing of services. BPO is typically categorized into back office outsourcing – which includes internal business functions such as human resources or finance and accounting, and front office outsourcing – which includes customer-related services such as contact center services. BPO that is contracted outside a company’s country is called offshore outsourcing. BPO that is contracted to a company’s neighboring (or nearby) country is called near shore outsourcing. Business Processing Outsourcing becomes a popular sector growing very fast in Bangladesh. Here some of major company over all activities, their goals, overview and scope descried in to the main part of this report. There have some certain number of facilities that makes this sector more popular, those advantages are- Very lower rate in human resource, available manpower , good governmental support, attractive infrastructures skilled employee, overall lower cost , strong reliability etc. Moreover, BPO helps an organization concentrate on its core competencies, improve efficiency, reduce cost and improve shareholders’ value. Several global giants from various industries have begun to realize the importance of BPO and have started outsourcing their non-core business functions. Bangladesh is a developing country in south Asia. Its economy depends mostly on agriculture. In the earliest period jute and tea industry were very raising industry. But the scenario is changed. Now our economy mostly depends on Ready Made Garments industry. Apart from garments industry BPO industry is a raising industry in Bangladesh. So the scenario is changing. Enroute’s start their journey in 2008. Its corporate office is located to Bharidhara DOHS, road no-03, house no-257 and Enroute Management Consultant Service (emc) is their sister concern. Modern sophisticated machineries and highly qualified and skilled professionals are the main instrument for this enroute’s success. In this report we have gone through the overall HR policies and practices of enroute International Limited. Enroute’s HR functions like Recruitment & Selection, Training & Development, Compensation & Benefit and Employee Relation are very systematic and legal. Enroute concentrates on employee development as well. They provide suitable compensation and benefits like basic salary, over time, gratuity, different types of bonus etc. I have found that Enroute’s HR policies and practices are systemic and sound enough. I think that is the way they should follow to improve and expand its business. Business Process Outsourcing (BPO) is a structured arrangement between an organization and a 3rd party outsourcing partner to handle operations and responsibilities of specific non-core business functions (or processes).”Outsourcing” became popular in the United States near the turn of the 21st century. But Bangladesh has first introduced this type of business before war. But this business is not popular on that time. Now Bangladesh is still a developing, virgin market in the BPO sector and has tremendous potential especially with competitive lower wage rates, higher supply of labor, also knowledge transfer for skilled workers with training and development is relatively cheaper. Since it is still an available market in the BPO sector we foresee not only to gain competitive advantage but also hope to achieve market leadership in the BPO sector here. An organization is nothing without human resource. Of all the resource, as well as a motive force for all other resources by manipulating them, by the way of developing, utilizing, commanding and controlling. So, human resource management (HRM) functions include recruitment, selection, training and development performance appraisal, Compensation and industrial relation in an organization. Enroute started his journey in 2008 as an organization of BPO. This report based on HR activities on Enroute International Limited that has practices to develop its organization. Since its inception in the year 2008, enroute with its highly experienced, passionate and expert business team, have been providing support & solutions to many Bangladeshi local and international companies of a selected segment. enroute has successfully made a mark wherever it has set foot through the years. The greatest potentials for the growth of any company are generated by a commitment to high corporate values. By values, we mean the qualitative goals which the company strives to achieve in all its activities. Values are the key to activating the five growth engines of a company: market, products & services, organization, people and finance. Values raise the quality of corporate energies and elevate work to a higher level. enroute pursues certain values to run ethical business. These are essential elements for business success. Enroute provide full concentration to their clients need. And try to best effort to satisfy them. 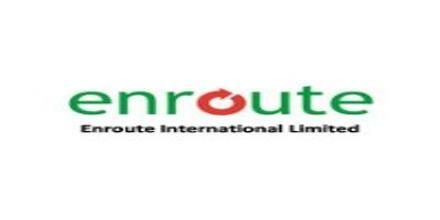 Since 2008, as enroute started its journey, it has flourished gradually from beginning. 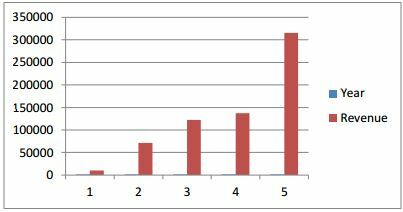 The following is the Revenue of this organization of the past five years. From the following figure we can easily understand that organization gradually prospered their revenue from year to year .Hopefully we can predict next five or ten years they are well established in BPO and lead this market. enroute is one of the leading providers of executive search and managerial recruiting services. The business of emc is assisting clients in building their human capital through a well-defined recruitment process as a value-added partner. Based on a client’s objectives, the firm determines the profile of skills and background required for a position and then, working discreetly and with the highest standards of integrity, identifies and evaluates the relevant competencies of candidates most appropriate for the role. We place an emphasis on building long-term relationships with our client and talents with highest collection of resumes. Enroute understands and values the importance of the talent pool that any organization counts on to bring synchronized and efficient business performance. It starts from recruiting the right talent properly; managing these talents to enable them performs in achieving company’s ultimate business goal. Enroute through one of its SBUs, enroute management consulting (emc) offers Talent Recruitment entry level recruitment, mid & senior-management level recruitment Performance Management Programs developing the effective performance program vision and tools, training the key management to ensure smooth implementation Reward & Recognition Program developing exciting and cost effective reward and recognition program e.g. The Checkered Flag, and manage the program on day to day basis. Enroute offer a long term partnership which ensures the opportunities for our clients and gives them a competitive edge over rivals. Enroute has been successfully providing outsourcing support to many businesses of Bangladesh both local and international. We ensure enhancement of the shared services of our clients while they focus entirely on their core activities with ease. Enroute Marketing Solutions with its highly experienced team have partnered with many local and international companies in enhancing the experiences for their consumers at retail and point of sales. We have been providing support for companies to manage their nationwide merchandising of the products and services. We also have the experience of managing brand promotion activities and retail for many big names in the market. Enroute has the experience of managing high value strategic channel for corporates in the country. We have been managing sales of specific target groups for our clients. We have been taking care of consumer promotions activities for companies we have partnered with. Sales and distributions are also activities we have successfully managing and creating value for our clients. Enroute’s PaySolutions is a unique managed service. We have been providing payroll solutions to many local and international organizations accommodating both small to large people resources. With our wealth of experience and our understanding of what businesses require from their payroll, we have grown in efficiency in the payroll outsourcing market. Our objective is to provide clients with a fast, reliable and user-friendly payroll service. We have the competent team, tools, processes, experience and local knowledge to deliver accurate, on time, and compliant payroll solutions, HR services, and Payroll Processing services, legal and statutory reports for our clients. We also manage fund disbursement to employees through client’s preferred or designated banks. Enroute’s office productivity tool, enroute office-pro, is a work place resource management service. We offer a one stop office solution or even a customized office solutions based on the needs and requirements of the client. This tool offers a wide array of services. From office set-up services to maintenance, or be it front desk services to managing the security service of your organization, through enroute office-pro we will provide you any service that your company requires without having to lose any focus from your core activities. We provide skilled human resources to assist you in your support activities from either your premises or from ours. So that individuals can remember the learning of the workshops better and actually believe to put the words into actions. We conduct various types of training and workshop for clients based on specific and customized needs / requirements. Their trainings and workshops are unique. We focus more on practical mode of learning through games and simulations. This enhances learning much higher. Enroute consultants are masters in their own fields. With years of experience and firsthand knowledge that they possess, our consultants have been successfully guiding businesses to prosper both in the public and private sectors. More to their experience, our experts hold deep understanding of the market situation of today’s competitive world to help you make the Right Decisions for Your Business. We are experts in identifying any potential room for improvement in your business. We Manage recruitment, training, organizational feedback systems, customer analysis and feedback. The horizon of enroute’s expertise is vast and includes areas like HR and Organization development, Business operations, marketing and branding, Finance and Accounts, Information service, Sales and distribution and Supply chain management. An Act to consolidate and amend the laws relating to employment of labor, relations between workers and employers , determination of minimum wage, payment of wages and compensation for injuries to workers, formation of trade unions, raising and settlement of industrial disputes, health, safety, welfare and working conditions of workers, and apprenticeship. Moreover labor law is primarily concerned with this elementary phenomenon of social power. And – this is important – it is concerned with social power irrespective of the share which the law itself has had in establishing it. The main object of labor law has always been to counteract the inequality of bargaining power which is inherent and must be inherent in the employment relationship. There can be no employment relationship without a power to command and a duty to obey. But the power to command and the duty to obey can be regulated. To improve the senile (absenteeism) conditions of industrial labor so as to provide for them the ordinal amenities (services) of life, and by that process. To bring about industrial peace which will to turn accelerate production activity. The nature of the report is exploratory and descriptive. The required information is collected from the following sources: Bangladesh Labor Law 2006, Amendment of Bangladesh Labor Law 2013, Journal, article and profile of organization. An employee or “labor” is defined as any person, including a trainee/probationer, whether the terms and conditions of his/her employment are expressly written or not, who is employed directly or through a contractor/agency, for any skilled, unskilled, physical, technical, business development or Clerical job in any establishment or industry. Apprentice: A worker who is employed in an establishment as a trainee and during the period of training he is paid an allowance is called an apprentice. Badli: A worker who is employed in an establishment for the period of temporary absence of a permanent or probationer worker. Casual: A worker employed on a casual basis. Temporary: A temporary worker in an establishment for work that is basically temporary in nature and is likely to be finished within a limited period. Probationer: A worker provisionally employed in any establishment to fill up a post of permanent vacancy and his probationer period has not to be completed. Permanent: A worker employed with a view to fill up a permanent post or if he completes satisfactorily his probation period in the establishment. Appointment letters, ID cards with photograph and registered books are made mandatory. The law specifies what information should be included in the appointment letter and in the registered book, and requires the latter to be signed by both the employer and the worker. Discharge means the expiry of the employment of a worker on the ground of inability or incapacity because of ill health. An employer can discharge a worker on the basis of the report of a Registered Physician. Every worker who has completed a continuous service for one year shall be entitled to get a benefit of 30 days wages for every completed year of service or the gratuity, whichever is higher. A permanent worker may terminate the employment serving a 30 days‟ notice to the employer and a temporary worker may terminate it serving a notice of 30 and 14 days case wise. In lieu of the notice, the worker can even terminate the employment returning the wages for that period. It means the expiry of the employment of a worker on the ground of redundancy. No worker who has been in continuous service for not less than one year under an employer shall be retrenched by the employer unless- The worker has been given one month‟s notice in writing, indicating the reasons for retrenchment, or the worker has been paid in lieu of such notice, wages for the period of notice. In the case of re-employment shall have preference on retrenched workers, each having priority according to the length of his service. New labor law deals with the dismissal of the worker on the ground of misconduct and conviction. (h) Falsifying, tampering with, damaging or causing loss of employer‟s official records. A period of inactivity or idealness. The act of dismissing employees especially temporarily. A period of enforced unemployment. Failure, refusal or inability of an employer, on account of shortage of power or raw material or the accumulation of stock or break down of machinery or for any other reason, to continue the employment to workers whose names are brought to the muster-roll of the factory. Any worker, whose name is there in the muster-roll of the factory and who has completed a continuous period of one year service, if laid off, shall be entitled to get the benefits of compensation for all the days except for the weekly holidays. A badli (transfer) worker whose name is brought in the muster roll shall not be treated as badli for the purpose of the compensation. (b) If any worker is laid off for 15 days or more after the first 45 days of lay off in a single calendar year the employer can retrench the worker instead of lay her/him off. A worker employed in any establishment, he/she can retire on the completion of the fifty-seventh year of his age. Every worker other than a casual or badli worker shall be permitted to a certificate of service from his employer at the time of his retrenchment, discharge dismissal, removal, retirement or termination of service. (a) Work hours are set at eight hours a day, 48 hours a week, with a weekly rest day. (b) Extra-allowance for overtime: When a worker works in an establishment on any day or a week then he/she is entitled to allowance at the rate of twice his ordinary rate of basic wage. (c) Workers are entitled to rest and meal in a day as follows: (i) one hour interval for over six hours work a day; (ii) half an hour interval for more than five hour work; and (iii) one hour interval once or half an hour interval twice for more than eight hours work a day. A „Minimum Wage Board‟ is established to determine the minimum rates of wages in different private sectors, taking into consideration varied criteria: cost of living, standard of living, productivity, business capability, and economic and social conditions of the country. OT pay is twice the hourly remuneration. Wages to be paid of employee‟s current bank accounts or any digital system (electronic transformation). The wages of every worker shall be paid before the expiry of the seventh day after the last day of the wage period in respect of which the wages are payable. Every worker has the right to participate in company’s profits/benefits. Absence from duty, damage or loss any materials due to neglect. If the service of a worker‟s annual leave is due before discharge, retirement, or any reason, the employer shall pay his wages in lieu of the unveiled leave at the rate he is entitled to the payment of wages during the period of leave. Organization has attractive bonus package for the time of occasion period. (a) There is one or two weekly rest days depends on organization‟s activity. (c) Every worker without newspaper workers shall be entitled to sick leave with full wages for 14 days in a calendar year. No child shall be employed or permitted to work in any occupation or establishment. If permitted then certificate of fitness in the prescribed form and granted to him by a registered medical practitioner is in the custody of the employer. Labor force is strictly prohibited in the organization. Employers are mandated to observe equal wages for male and female workers for work of equal nature or value. Every employer should provide compensation to its workers for work-related injury, disability and death. If a worker dies while in service after a continuous service of not less than two years, his nominee or in the absence of an nominee, his dependent shall be paid by the employer a compensation at the rate of thirty days wages for every completed year of service, or for any part thereof in excess of six months or gratuity, or a worker die after accident due to working hour, then the employer a compensation at the rate of forty five days wages. In this case nominee receives death benefit which is higher. (a) Sufficient number of fire extinguisher & emergency fire exit, protective tools and so on. (b) Employers are required to take appropriate measures to protect workers from danger and damage due to fire or other accident. (b) The work room should not be overcrowded and injurious to the health of the workers. (c) Every establishment should provide pure drinking water, sufficient light and air and separate toilets for its male and female workers. In every establishment factory wherein more than twenty five workers are employed, shall maintain compulsorily, in the prescribed manner, a safety record book and safety board. (b) Factories are required to have an in-house canteen for sufficient workers. (d) Child care facility: In every establishment, where forty or more workers are ordinarily employed, there shall be provided and maintained a suitable child care. Three hundred or more workers are ordinarily employed, there shall be provided and maintained a sick room with dispensary of the prescribed size, containing the prescribed equipment or similar facilities, in the charge of such medical and nursing staff as may be prescribed. Five hundred or more are employed, in this case organization appoint a medical staff. If any employee is injured or accident in the time of working hour, then company carry all treatment cost until recovered. (a) An establishment provident fund in private sector may constitute for the benefits of its worker. Such provident fund shall be constituted in such manner as may be prescribed by rules made by the establishment that means three-fourths of its workers demand. Such provident fund shall be held and administered by a board of trustees. Such board of trustees shall consist of an equal number of representatives of the employer and workers employed in the establishment and a person nominated by the government shall be its chairman. (b) Establishments with 200 or more workers should institute a group insurance. Trade Union is an organization of workers who have banded together to achieve common goals such as protecting the integrity of its trade, achieving higher pay, increasing the number of employees an employer hires, and better working conditions. The most common purpose of these associations or unions is “maintaining or improving the conditions of their employment”. Every worker employed in any establishment has the right to form and join a trade union of their own choice. Trade unions have the right to draw up their own constitution and rules and to elect their representatives. And there has mandatory of 10% female worker must be included in executive committee out of total 20% female workers. Objectives Trade unions are the only way to manage, compliant, and control the labor force. Lots of objectives are there to organize trade unions. (b) To strengthen their (labor) bargaining power collectively to establish and achieve all their rights. (c) To dully protect all other interest of the workers. Employers are also prohibited in terminating workers in the course of trade union organizing in the work place. Collective bargaining begins with the assumption that only the law limits of employer‟s decision-making power. This includes laws that apply to the collective bargaining process, such as employment standards legislation and that apply to all workers. Collective bargaining attempts to improve on these minimum acceptable wage rates and conditions of work. The trade union is allowed to serve as a collective bargaining agent in any establishment. Punishment for labor law violations is not signified out under the BLL. In some cases, the law is simply silent like in the case of forced labor prohibition. 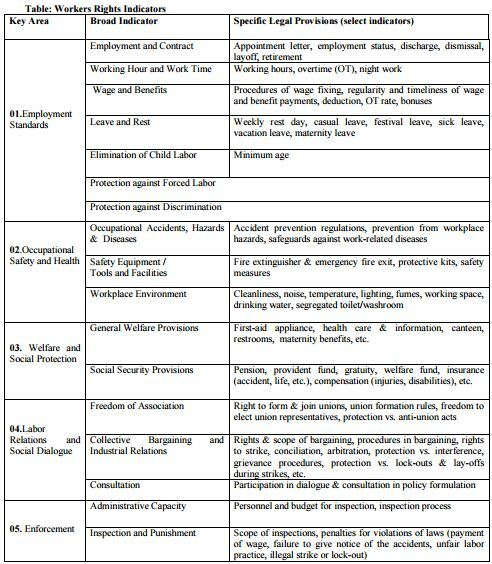 Inspection and Punishment Scope of inspections, penalties for violations of laws (payment of wage, failure to give notice of the accidents, unfair labor practice, illegal strike or lock-out). or affordable cost to the workers and their unions. Labor has a vital role in increasing productivity and management has to help create condition in which workers can make their maximum contribution towards this objective. The labor movement and the trade unions have greater responsibility which can make an increasing contribution to national policy and development. Enroute started their journey and always maintain their all business activity according to Bangladesh labor law. They provide friendly working environment for their employ and other facilities like as general welfare provisions, workplace environment, safety security equipment / tools and facilities etc. are preserve to protect any bad incident. They followed the Bangladesh labor law strictly. Organization strictly prohibited child labor, protection against discrimination and labor force as well as gives space freedom of association, participation in dialogue & consultation in policy formulation. Enroute followed employment standards to all his employees. Their working process and others activities on business transaction are always through technologically and cautiously modernize on phase. They evaluate their employee’s performance on work and motivate them by giving reward / incentive. Business Process Outsourcing (BPO) is the next opportunity for Bangladesh, BPO offers significant opportunities to create jobs and diversify the export basket and move to new phase. Bangladesh has one of the highest numbers of young people. They all are educated and potentially creative minds but they have no experience. By providing training (technology, computer, language) and generating country asset. At first we need to create awareness. As well as we need to prepare and advertise it. We have to put all our hands together and try to go our desired destination. Bangladesh is in an advantageous position and the country should not miss the chance to increase its share of the pie. As we see our country’s corporate culture, we see the sequence: jute is the cash crop of Bangladesh before war and after war garments sector has the greatest contribution on our economy. But recently some bad incident this sector is quite unstable. And in this time Business Process Outsourcing sector is gradually flourished. A third of the nearly 16 crore people of Bangladesh are between the age of 15 and 34 years and an increasing number are getting educated. In Bangladesh BPO costs are 40 percent lower compared to India and the Philippines. BPO offers significant opportunities to create jobs and diversify the export basket and move from the current dependence on readymade garments. The government provides support to help the sector grow.